The Rhythm Bones Society presents a show you won't want to miss! The most renowned bones players from across the country will be gathering at Clark's to play an instrument that dates back as far as recorded civilization! From street performers to members of the President's own Marine Band, these bones players hail from all parts of the country and play to all genres of music. The real magic happens when they all come together for two special 25-minute performances. To see the Rhythm Bones Society shows, guests must purchase a general admission ticket to Clark's Trading Post at the railroad station on June 9. Tickets are $22 ages 4-64 and $20 ages 65 and up. Each ticket includes the bear show, train rides, plus all the rides and attractions Clark's has to offer. 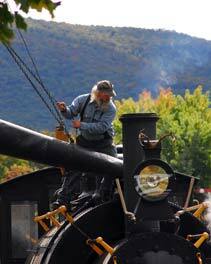 Revel in the rich history of railroading with special excursions on the White Mountain Central Railroad. Rail fans can ride steam locomotives and see rare and unique equipment on display. The Baldwin, Climax and Porter steam locomotives and a GE 65-ton diesel engine will be in operation on this spectacular weekend celebrating 60 years of riding the rails on the White Mountain Central Railroad. To join in the fun of Railroad Days, guests must purchase a general admission ticket at the railroad station. Tickets are $22 for ages 4-64 and $20 for ages 65 and up. Each ticket includes all the Railroad Days events, the bear show, train rides, plus all the rides and attractions Clark's has to offer.